Pet doors can be very handy, giving your dachshund easy access to your outside fenced yard, for toileting, play or just a lie in the sun. Inside pet gates or doors are also useful when toilet training or just to limit your dogs access to certain areas of the house. 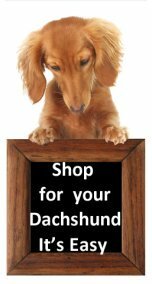 These doors can be fitted into glass doors, windows or wooden doors, ensure these are fitted to the correct height so your dachshund does not have to jump in and out, you may need to install a small step. Before installing a door for your pet, I recommend that you complete your dog toilet training, so that your dachshund knows what area is to be used. Sometimes you can have problems with other animals e.g neighbors pets coming in to your home uninvited, it is now possible to install a door with programmable infrared technology that allows access for your dog when he/she wears the color coded key. A remote control dog door unlocks when your dog approaches. Weather resistant,able to be used in windows and doors, manual 4 way locking system. When we adopted our dachshund Jazz she already knew to go toilet outside, and she would go to the door, often when she did not particularly need to go out so some one would have to open the door all the time. After several weeks we decided to install a door, and this was a very good idea. To encourage her to use the door I would put a food treat just outside so she would go half out and I would hold up the flap and talk quietly to her, as she did not like the flap. After several days I was able to rest the flap on her back, over the following days I slowly moved the treat back so she had to go right out, then I would hold up the flap and call her name to get her to come back inside. She only took about three weeks before she would use the door without prompting, and did not worry about the flap in fact she was quite smart about it. This is an attractive steel painted security pet door with a magnetic weather tight flap. 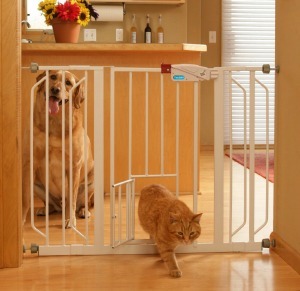 Many owners have found this an excellent pet door with both dogs and cats coping with it well. Easy to install by following directions carefully. This is a great valued dog door, made from high quality plastic with adjustable frame to fit most doors, is quick and easy to install, suitable for pets up to 35 pounds. Top quality dog door, keeps the weather out so ideal for hot and cold climates, with adjustable inner frame so will fit most doors, suitable for pets up to 12 pounds. Helps keep your dachshund in his area, quick to set up, chew-proof steel construction with easy release handle. To view the full range of dog doors and gates available visit Amazon.